It’s one of the biggest problems with trying to drop pounds: Cutting back on calories leaves you lethargic and just all-around cranky. So we asked Lisa Young, Ph.D., R.D., adjunct professor of nutrition at New York University and author of The Portion Teller Plan, to share which foods will help improve your mood and keep you on track for your weight-loss goals. Win-win! The omega-3 fatty acids in this fish have been linked to better moods, says Young. What’s more, it can also help you maintain a healthy body weight—particularly if it replaces red meat. Try to pack in three servings of this fatty fish a week. This hearty green is rich in magnesium—and when you’re low in this mineral, you can end up feeling tired, irritable, and even foggy, says Young. Spinach is also high in vitamins A, B, and C, and it’s a solid source of iron and protein, both of which pump up energy levels. It gets better: Research has found that spinach may boost weight loss by reducing cravings for sweets and salty junk food. High-protein foods, such as Greek yogurt, can spur the creation of life-is-good brain chemicals like dopamine and norepinephrine and also rev up our energy levels and alertness, says Young. Luckily, this is also a golden food for helping with weight loss: Researchers at the University of Tennessee in Knoxville found that people who ate 18 ounces of Greek yogurt daily while cutting total calories lost more weight and more belly fat than those who skipped the creamy treat. 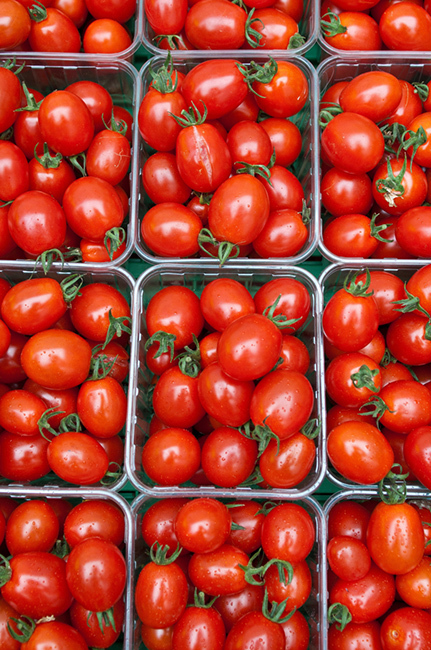 These are rich in the phytonutrient lycopene, which helps slow the accumulation of inflammatory compounds tied to bad moods and feelings of sluggishness, says Young. Because these poppers are also bite-sized and low-cal, they keep you on track with your weight-loss plans. Tuna is high in omega-3’s, while whole grains help keep you feeling good, says Young; they prompt the body to release the mood-regulating hormone serotonin, leading to feelings of contentment. Whole grains also promote satiety, so you’re less likely to overeat. Berries get their color from a purple pigment called anthocyanin, which is a mood enhancer, says Young. What’s more, all berries are high in fiber and water, so you feel full for a longer period of time when you eat them. *This story was originally published on WomensHealth.com by Julie D. Andrews.